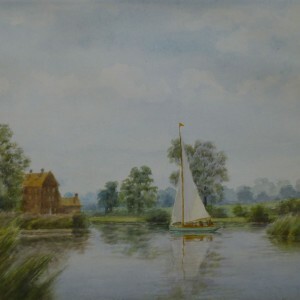 William Coman who was born and lived in Acle all his life received his art training at Yarmouth School of Art and exhibited in the Post Office Exhibitions, the Civil Service Exhibitions, the Guildhall and he also exhibited with the Norfolk and Norwich Art Circle from 1934 – 1952. William Coman was a founder member of the Great Yarmouth & District Society of Artists serving as both Chairman and President. Established in 1987, Norwich based Tudor Galleries specialises in traditional paintings for enjoyment and investment. Advice on the sale of collections, valuations, conservation, restoration and much more besides! With prices starting at just £25, a Tudor Galleries gift voucher is the perfect present for any occasion. Tudor Galleries is situated between the Theatre Royal and the Assembly House, directly opposite The Forum.